There is a lot more in him than you guess, and a deal more than he has any idea of himself. -Gandalf, speaking to the dwarves about his choice of Bilbo to be their burglar, in The Hobbit by J.R.R. Tolkien. Today (December 17, 2014) marks the release of the third and final movie installment of The Hobbit, directed by Peter Jackson, and perhaps our last film adaptation of Tolkien’s Middle Earth, unless someone tries to unravel The Silmarillion or tries to flesh out any number of short stories. I plan to see the movie (not today, or even this week -probably), because this story is such an important part of my literary life. I read The Hobbit for the first time as a 14 year old, then moved on to the LOTR Trilogy. I recently read it again (a couple of years ago, prior to the film releases), and was still amazed by its light-heartedness compared to the later trilogy – though the films are trying to invoke that more brooding environment. 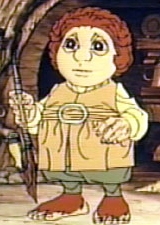 My enjoyment of The Hobbit has always centered around Bilbo Baggins. He was written as such a likeable character and an everyman that readers (and I think, especially adolescents) could relate to. He wasn’t adventurous and had never sought out grand change – yet, he had the internal bravery to go beyond his comfort zone when faced with the choice. He wasn’t thought of as much of a warrior or a contributor to the dwarves group. He was very much an outsider, culturally and personality-wise. He didn’t fit their idea. Yet Gandalf knew…and took a chance. Either he knew something of Bilbo’s ancestry (as Tolkien suggests some of Bilbo’s ancestors were more adventurous hobbits – which made them something of a novelty to the culture) or he recognized something in Bilbo’s personality that made him appealing in the role of burglar. Perhaps, it is because he was so small. Perhaps, it was because he was so self-effacing. Perhaps, it was because hobbits are generally resilient and self-preserving, yet light hearted. Whatever the reason, Bilbo ultimately proves his worth to the group and grows in confidence by saving them from various situations until the dwarves accept him. He returns to his home at Bag-End a wiser, more confident hobbit. And while he was also the fortunate finder of a ring of power and being literally invisible is much more useful than just being ignored, the ability of people to achieve things under unusual circumstances should never be underestimated. Certainly Bilbo had to prove himself, but he also was put in circumstances where he had to do something. He chose to help out Thorin and Company. His self-preservation didn’t win out. This is seen later in other hobbits in the trilogy: Frodo, Sam, Merry and Pippin all faced challenges and stepped in to do something. That is the redeeming part of Tolkien’s Middle Earth Saga, that hobbits and other creatures (Ents?) viewed as unimportant tipped the balance and achieved great things. This entry was posted in Blogroll, knowledge, nostalgia, prose, self confidence, Uncategorized, writing and tagged Achievement, Hobbits, Not Poetry, prose, Resilience, The Hobbit, Tolkien, writing on December 17, 2014 by John S.